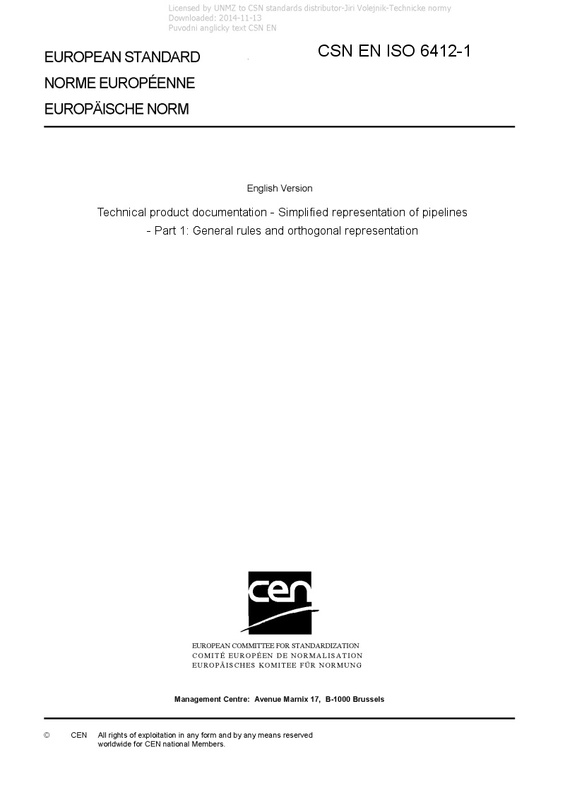 EN ISO 6412-1 Technical product documentation - Simplified representation of pipelines - Part 1: General rules and orthogonal representation - ISO 6412-1:2017 specifies rules and conventions for the execution of simplified drawings for the representation of all kinds of pipes and pipelines made of all sorts of materials (rigid and flexible). ISO 6412-1:2017 is used whenever it is necessary to represent pipes or pipelines in a simplified manner. For the purposes of this document, the figures illustrate the text only and should not be considered as design examples. NOTE This document can also be used for the representation of similar installations, such as ventilation or air-conditioning systems; in such cases, the term "duct", etc. is substituted for the term "pipe".